You've just dashed off a reply to an important email message. When you hit the 'Send' button, you discover that it's dimmed, which means you can't send your message. Mail was working fine yesterday; what went wrong? A dimmed 'Send' button in Apple Mail means there isn't a correctly configured outgoing mail server (SMTP) associated with the Mail account. This outcome can happen for a number of reasons, but the two most likely are as follows: either the mail service you use made changes to its settings and you need to update your settings, or your Mail preference file is outdated or corrupt—or has the wrong file permissions associated with it. Occasionally, your mail service may make changes to its mail servers, including the server that receives your outgoing email. These types of mail servers are frequent targets of malware designed to turn them into zombie spam servers. Because of the ever-present dangers, mail services occasionally upgrade their server software, which may in turn require you to change the outgoing mail server settings in your email client, in this case, Mail. Before you make any changes, be sure that you have a copy of the settings that your mail service requires. In most cases, your mail service has detailed instructions for various email clients, including Apple Mail. When these instructions are available, be sure to follow them. If your mail service only provides general instructions, this overview on configuring your outgoing mail server settings may be helpful. 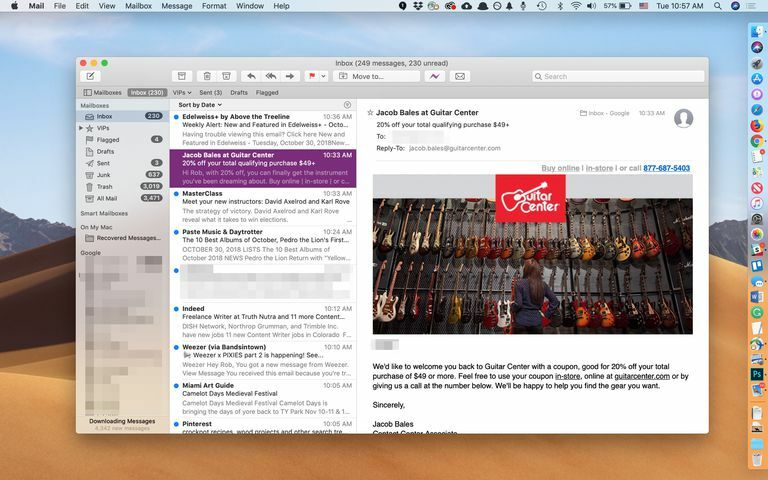 Launch Apple Mail and select Preferences from the Mail menu. In the Mail preferences window that opens, click the 'Accounts' button. From the list, select the mail account that's giving you problems. Click the 'Account Information' tab or the 'Server Settings' tab. The tab you select depends on the version of Mail you are using. You're looking for the pane that includes incoming and outgoing mail settings. In the 'Outgoing Mail Server (SMTP)' section, select 'Edit SMTP Server List' from the dropdown menu labeled either 'Outgoing Mail Server (SMTP)' or 'Account,' once again depending on the version of Mail you are using. A list of all the SMTP servers set up for your various Mail accounts will display. The Mail account you selected above should be highlighted in the list. Click the 'Server Settings' or 'Account Information' tab. In this tab, make sure the server or host name is entered correctly. An example would be smtp.gmail.com, or mail.example.com. Depending on the version of Mail you are using, you may also be able to verify or change the user name and password associated with this mail account. If the user name and password are not present, you can find them by clicking the Advance tab. In the Advance tab, you can configure the SMTP server settings to match those that your mail service provides. If your mail service uses a port other than 25, 465, or 587, you can enter the required port number directly in the port field. Some older versions of Mail require you to use the 'Custom port' radio button and add the port number provided by your mail service. Otherwise, leave the radio button set to 'Use default ports' or 'Automatically detect and maintain account settings,' depending on the version of Mail you're using. Use the Authentication dropdown menu to select the authentication type your mail service uses. Finally, enter your user name and password. The user name is often just your email address. Try sending the email again. The 'Send' button should now be highlighted. One possible reason for the problem is a permission issue preventing Apple Mail from writing data to its preference file. This type of permission problem prevents you from saving updates to your Mail settings. How does this happen? Typically, your mail service tells you to make changes to the settings for your account. You make the changes and all is well—until you quit Mail. The next time you launch Mail, the settings are back to the way they were before you made the changes. With the Mail app now having incorrect outgoing mail settings, its 'Send' button is dimmed. To correct file permission issues in OS X Yosemite and earlier, follow the steps outlined in the 'Using Disk Utility to Repair Hard Drives and Disk Permissions' guide. If you're using OS X El Capitan or later, you don’t need to worry about file permission issues, the OS corrects the permission with each software update. The other possible culprit is that the Mail preference file has become corrupt or unreadable. This situation may cause Mail to stop working or prevent certain features—such as sending mail—from working correctly. Before proceeding, make sure you have a current backup of your Mac since the following methods to repair Apple Mail can cause email information, including account details, to be lost. Finding the mail preference file can be a challenge because ever since OS X Lion, the user's Library folder is hidden. However, you can gain access to the Library folder with this easy guide: OS X Is Hiding Your Library Folder. The Apple Mail preference file is located at: /Users/user_name/Library/Preferences. For example, if your Mac's username is Tom, the path would be /Users/Tom/Library/Preferences. The preference file is named com.apple.mail.plist. Once you're finished with these steps, try Mail again. You may need to re-enter any recent changes to the Mail settings, per your mail service. But this time you should be able to quit Mail and retain the settings. If you still have problems with Mail and sending messages, take a look at the Troubleshooting 'Apple Mail - Using Apple Mail's Troubleshooting Tools' guide.